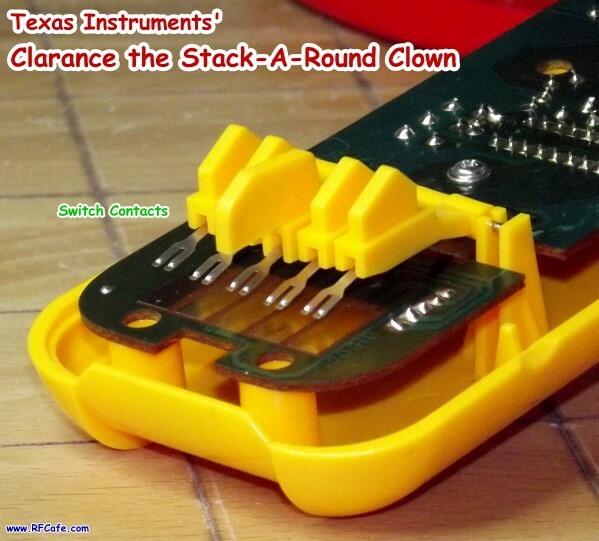 In 1991, Texas Instruments proudly introduced "The first electronic stacker for infants and toddlers." 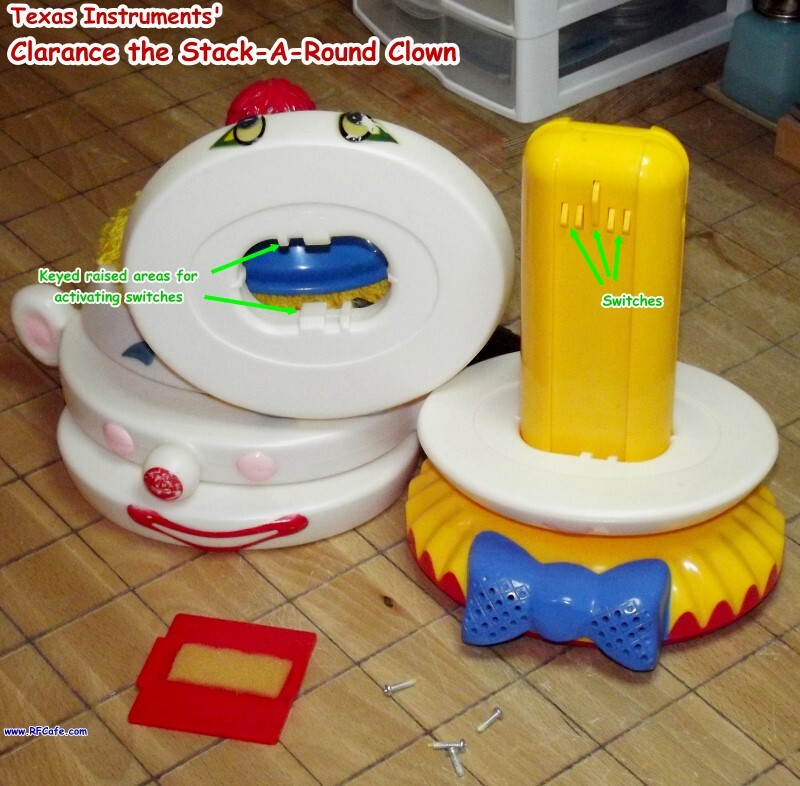 Clarance* the Stack-A-Round Clown features five layers of rotatable, flippable head/face rings that can be disassembled and reassembled by the player, with each removal and replacement of a ring initiating a spoken phrase by Clarance. How I came to own this mildly interesting toy is a story unto itself (see below). I could not resist the urge to take the Stack-A-Round Clown apart to see what makes him tick (or talk, as the case happens to be). As shown in the photos, all the electronic heavy lifting is performed by a single speech synthesizer IC package by TI (part number CSM11057AN with 1991 date code - could not locate a datasheet). 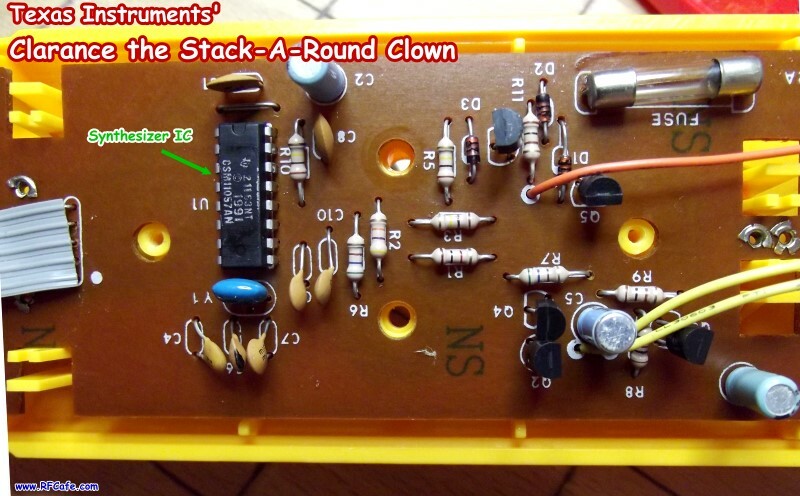 Otherwise there are just a few scattered Rs, Ls, and Cs, with a couple discrete transistors. 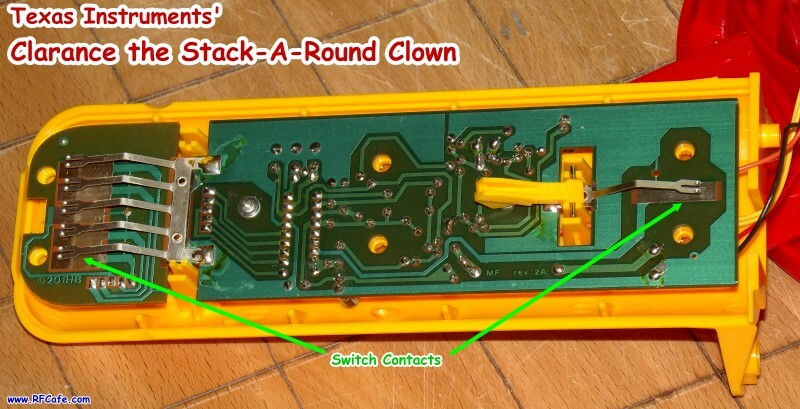 Six switches are fabricated from a simple arrangement of spring metal fingers that make contact with pads on the PCB. 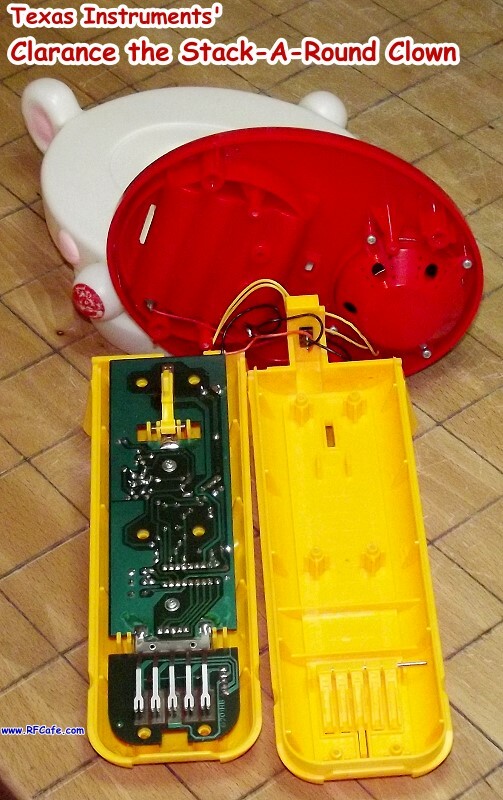 The five plastic head ring layers are keyed to activate specific switches to make Clarance speak. Here is a brief video of Clarance in action. 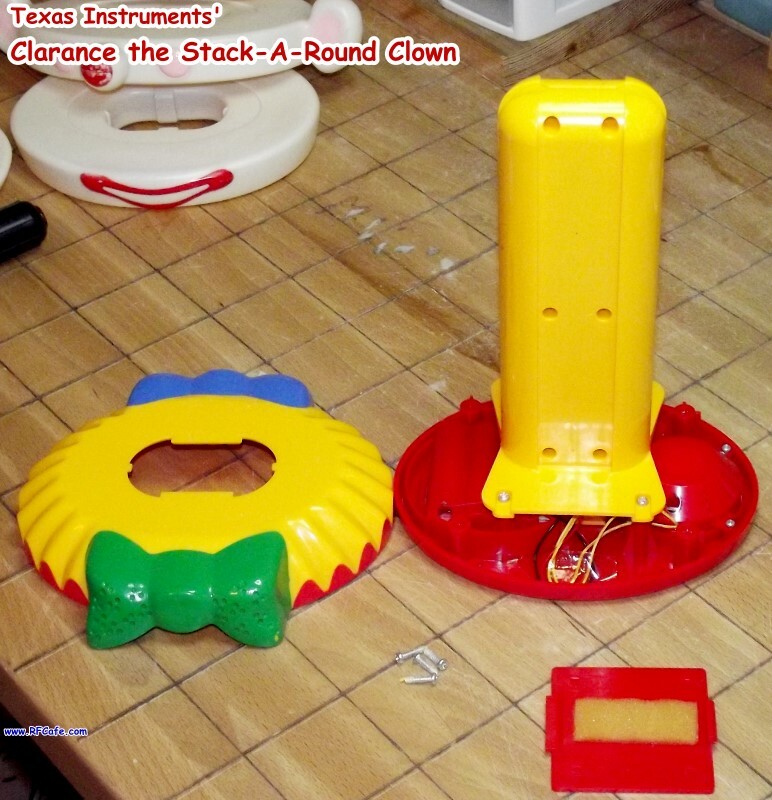 The original literature provided with Clarance the Stack-A-Round Clown claimed there are more than 1,000 combinations of stacking possibilities. Let's see, there are 5 rings. Each ring can be oriented with either of two face components and can be either rightside-up or upside-down, for a total of 4 possibilities. If my statistics formula is correct, that makes for 45 combinations, which equals 1,024. We have agreement. In testing to determine how intelligent Clarance is, I turned his mouth upside down and he said he was unhappy. Turning his eyes upside down made him think they were closed. However, when I built the entire head upside down, he thought he was unhappy even though technically he was still smiling. Or, maybe he just doesn't like standing on this head. 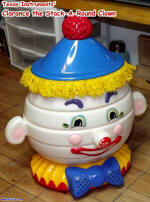 Clarance The Stack-A-Round Clown in full glory. 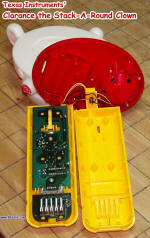 Keyed ring tiers activate switches as they are installed or removed. The other side of Clarance. * It could be spelled 'Clarence,' but the DataMath website has is spelled with two a's. 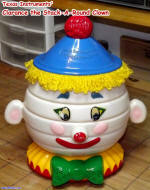 How did I happen to procure this Stack-A-Round Clown? It's a sad story, actually. My daughter's house burned to a total loss in March of this year (2014). 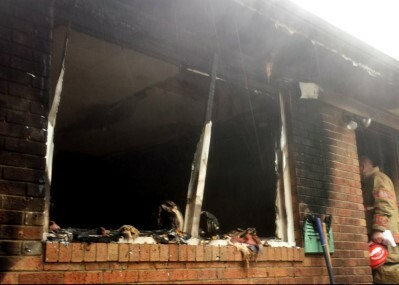 Two dogs and a baby duck succumbed to smoke inhalation, but no people were home at the time. Part of the loss was the toys we had kept for her from when she was a little girl. All the plastic items were melted or full of smoke residue and therefore unrecoverable. Her house is in the process of being rebuilt, but many of the contents will be difficult to replace - trophies from karate contests and horse shows, books, homemade clothing, photos, memorabilia, etc. Melanie and I are attempting to find as many of the lost toy items as possible on eBay and Etsy to present to her as a house warming gift when the house is ready at the end of the year (early December projected). The clown toy was included as part of a package deal along with a Fisher Price sink set that we wanted, and it seemed like an apt subject for a teardown. 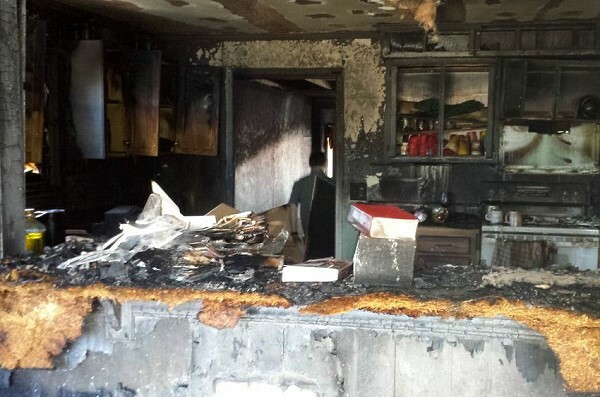 I have included a couple photos of the fire aftermath to give you an idea of how devastating a house fire can be, in case you have never witnessed it. One area of the house (single story rancher) far from the origin managed to be left standing, but the intense heat and smoke rendered it a total loss. The picture to the right is especially interesting because it demonstrates the temperature gradient during the fire. 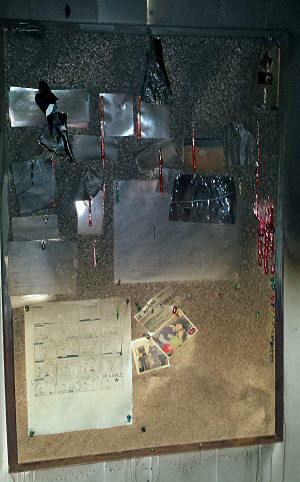 The red plastic map tacks in the upper section of the bulletin board are melted and running down, whereas the same type map tacks in the bottom part of the board are still solid. As of this writing, the remains of the old house, including the foundation, have been hauled away. You would never know a house had once been standing there. Weird.